Matthew Paterson struck an extra-time winner as League Two Southend shocked Championship Bristol City in an action-packed Carling Cup first round tie. He headed home a left wing cross from Ryan Hall in the 104th minute. Jamie McAllister opened the scoring for City with a 25-yard free-kick but Paterson levelled with a penalty. City regained the lead when Ivan Sproule slid home a cross from Albert Adomah only for Barry Corr to head in and send the tie into extra-time. The win was a rare one in the league cup for Southend boss Paul Sturrock, who had tasted victory only once in nine attempts during his managerial career. And his side were forced to come from behind after conceding to McAllister's cracking set-piece on only two minutes. City should have doubled their advantage but Ivan Sproule miscontrolled a cross when unmarked 12 yards out. But instead, Southend drew level when Anthony Grant was pulled down in the box by Jamal Campbell-Ryce and Paterson scored from the spot, his kick going in off the underside of the bar. Both sides had their chances to take the lead, with Louie Soares and Grant going closest. It was City who struck again when Sproule made up for his earlier miss by converting from Adomah's low, left-wing cross. However, Southend were behind for only six minutes as substitutes Scott Spencer and Corr combined for the latter to nod in. And in extra-time the last word went to Paterson, thumping home a header from Hall's cross to send the hosts into the next round. "I'm pleased for the players, we showed tonight we are a squad, and not just a team. There were lots of players who did not let us down. "I'm very pleased for everyone at the football club. The boys did all the right things, including Barry Corr's first goal. "I don't want to single out anybody it was a great squad performance." "To have the initiative twice, especially after the second goal, and then to lose the momentum and put them on the front foot is very disheartening. "You look at our line up and we had to field a midfield player in defence. I hope I'm not making excuses, just stating facts.
" In terms of effort after 120 minutes I couldn't ask any more of my players." 120:00+2:25 Defending throw-in by Nicky Hunt (Bristol City). 120:00+1:41 Direct free kick taken right-footed by Anthony Grant (Southend) from left wing, passed. 120:00+1:41 Booking Ivan Sproule (Bristol City) booked for unsporting behaviour. 120:00+1:41 Foul by Ivan Sproule (Bristol City) on Anthony Grant (Southend). 120:00+1:20 Defending throw-in by Jamie McAllister (Bristol City). 120:00+0:14 Free kick crossed right-footed by Lee Johnson (Bristol City) from left wing, clearance by Matthew Paterson (Southend). 120:00+0:14 Booking Josh Simpson (Southend) booked for persistent infringement. 120:00+0:14 Foul by Josh Simpson (Southend) on John Akinde (Bristol City). 119:58 Goal kick taken long by Dean Gerken (Bristol City). 119:46 Shot by Ryan Hall (Southend) right-footed from left channel (35 yards), over the bar. 119:23 Defending throw-in by Nicky Hunt (Bristol City). 118:25 Foul by Nicky Hunt (Bristol City) on Ryan Hall (Southend). Direct free kick taken right-footed by Anthony Grant (Southend) from left wing, passed. 118:05 Goal kick taken long by Glenn Morris (Southend). 117:52 Shot by Marlon Jackson (Bristol City) volleyed right-footed from left channel (20 yards), missed left. 117:24 Inswinging corner from left by-line taken right-footed by Lee Johnson (Bristol City) to far post, clearance by Graham Coughlan (Southend). 116:55 Foul by Josh Simpson (Southend) on Marlon Jackson (Bristol City). Free kick crossed right-footed by Lee Johnson (Bristol City) from left wing, resulting in open play. 115:56 Goal kick taken long by Glenn Morris (Southend). 113:39 Attacking throw-in by Chris Barker (Southend). 113:28 Goal kick taken long by Dean Gerken (Bristol City). 112:53 Defending throw-in by Nicky Hunt (Bristol City). 112:31 Goal kick taken long by Glenn Morris (Southend). 112:18 Shot by Marlon Jackson (Bristol City) volleyed right-footed from right side of six-yard box (6 yards), over the bar. 111:25 Defending throw-in by Josh Simpson (Southend). 111:09 Foul by Matthew Paterson (Southend) on Marvin Elliott (Bristol City). Direct free kick taken right-footed by Marvin Elliott (Bristol City) from own half, resulting in open play. 110:47 Attacking throw-in by Nicky Hunt (Bristol City). 110:05 Goal kick taken long by Dean Gerken (Bristol City). 109:27 Foul by David Clarkson (Bristol City) on Graham Coughlan (Southend). Direct free kick taken right-footed by Glenn Morris (Southend) from own half, resulting in open play. 109:00 Goal kick taken long by Dean Gerken (Bristol City). 108:29 Foul by Jamie McAllister (Bristol City) on Scott Spencer (Southend). Direct free kick taken right-footed by Graham Coughlan (Southend) from own half, resulting in open play. 107:57 Cross by Ivan Sproule (Bristol City), save (caught) by Glenn Morris (Southend). 107:39 Barry Corr (Southend) caught offside. Indirect free kick taken right-footed by Dean Gerken (Bristol City) from own half, resulting in open play. 107:12 Goal kick taken long by Dean Gerken (Bristol City). 106:41 Attacking throw-in by Josh Simpson (Southend). 105:50 Goal kick taken long by Dean Gerken (Bristol City). 105:26 Cross by Marvin Elliott (Bristol City), clearance by Graham Coughlan (Southend). 105:11 Defending throw-in by Nicky Hunt (Bristol City). 105:00+0:53 Attacking throw-in by Jamie McAllister (Bristol City). 104:40 Goal kick taken long by Dean Gerken (Bristol City). 104:07 Shot by Barry Corr (Southend) left-footed from left side of penalty area (18 yards), over the bar. 102:50 Assist (cross) by Ryan Hall (Southend) from left wing. 102:50 GOAL - Matthew Paterson:Southend 3 - 2 Bristol City headed goal by Matthew Paterson (Southend) (bottom-left of goal) from centre of penalty area (12 yards).Southend 3-2 Bristol City. 102:09 Cross by Jamie McAllister (Bristol City), foul by Marvin Elliott (Bristol City) on Luke Prosser (Southend). Direct free kick taken right-footed by Glenn Morris (Southend) from own half, resulting in open play. 101:26 Inswinging corner from left by-line taken right-footed by Gavin Williams (Bristol City) to centre, clearance by Chris Barker (Southend). 101:10 Goal kick taken long by Dean Gerken (Bristol City). 100:26 Cross by Lee Johnson (Bristol City), header by John Akinde (Bristol City) from centre of penalty area (12 yards), save (caught) by Glenn Morris (Southend). 99:54 Attacking throw-in by Josh Simpson (Southend). 99:35 Shot by Jamie McAllister (Bristol City) left-footed from left channel (25 yards), save (caught) by Glenn Morris (Southend). 98:57 Cross by Matthew Paterson (Southend), save (caught) by Dean Gerken (Bristol City). 98:35 Cross by Nicky Hunt (Bristol City), clearance by Graham Coughlan (Southend). 97:41 Foul by Graham Coughlan (Southend) on John Akinde (Bristol City). Direct free kick taken left-footed by Jamie McAllister (Bristol City) from own half, resulting in open play. 97:25 Attacking throw-in by Josh Simpson (Southend). 96:54 Foul by Jamie McAllister (Bristol City) on Scott Spencer (Southend). Direct free kick taken right-footed by Anthony Grant (Southend) from right wing, passed. 96:30 Attacking throw-in by Chris Barker (Southend). 94:38 Cross by Liam Fontaine (Bristol City), save (caught) by Glenn Morris (Southend). 93:48 Foul by Marlon Jackson (Bristol City) on Anthony Grant (Southend). Free kick taken left-footed by Ryan Hall (Southend) from right channel (25 yards), hit wall. 93:42 Goal kick taken long by Glenn Morris (Southend). 93:13 Substitution Bristol City substitution: Albert Adomah replaced by Marlon Jackson (tactical). 92:34 Defending throw-in by Nicky Hunt (Bristol City). 92:15 Goal kick taken long by Glenn Morris (Southend). 92:04 Header by Albert Adomah (Bristol City) from centre of penalty area (18 yards), missed right. 91:20 Attacking throw-in by Gavin Williams (Bristol City). 90:56 Attacking throw-in by Jamie McAllister (Bristol City). 90:22 Direct free kick taken right-footed by Dean Gerken (Bristol City) from own half, resulting in open play. 90:22 Booking Scott Spencer (Southend) booked for unsporting behaviour. 90:22 Foul by Scott Spencer (Southend) on Lee Johnson (Bristol City). 90:00+4:05 Inswinging corner from left by-line taken right-footed by Lee Johnson (Bristol City) to near post, clearance by Josh Simpson (Southend). 90:00+3:09 Attacking throw-in by Chris Barker (Southend). 90:00+2:12 Direct free kick taken right-footed by Glenn Morris (Southend) from own half, resulting in open play. 90:00+2:12 Booking Lee Johnson (Bristol City) booked for unsporting behaviour. 90:00+2:12 Foul by Lee Johnson (Bristol City) on Anthony Grant (Southend). 90:00+2:00 Cross by Ivan Sproule (Bristol City), resulting in open play. 90:00+1:22 Foul by Matthew Paterson (Southend) on Nicky Hunt (Bristol City). Direct free kick taken right-footed by Nicky Hunt (Bristol City) from own half, resulting in open play. 90:00+0:36 Attacking throw-in by David Clarkson (Bristol City). 90:00+0:14 Foul by Barry Corr (Southend) on Jamie McAllister (Bristol City). Direct free kick taken right-footed by Dean Gerken (Bristol City) from own half, resulting in open play. 89:47 Defending throw-in by Jamie McAllister (Bristol City). 89:29 Inswinging corner from left by-line taken right-footed by Scott Spencer (Southend) to far post, resulting in ball out of play. 89:17 Shot by Scott Spencer (Southend) left-footed from centre of penalty area (12 yards), blocked by Jamie McAllister (Bristol City). 88:42 Goal kick taken long by Glenn Morris (Southend). 88:21 Defending throw-in by Chris Barker (Southend). 87:25 Assist (cross) by Scott Spencer (Southend) from right wing. 87:25 GOAL - Barry Corr:Southend 2 - 2 Bristol City Headed goal by Barry Corr (Southend) (bottom-right of goal) from centre of penalty area (12 yards).Southend 2-2 Bristol City. 86:51 Defending throw-in by Chris Barker (Southend). 86:02 Substitution Southend substitution: Louie Soares replaced by Scott Spencer (tactical). 86:02 Goal kick taken long by Glenn Morris (Southend). 85:46 Cross by Liam Fontaine (Bristol City), clearance by Luke Prosser (Southend). 85:25 Outswinging corner from right by-line taken right-footed by Lee Johnson (Bristol City) to far post, resulting in open play. 84:44 Inswinging corner from left by-line taken right-footed by Gavin Williams (Bristol City) to far post, save (parried) by Glenn Morris (Southend). 82:52 Foul by Marvin Elliott (Bristol City) on Barry Corr (Southend). 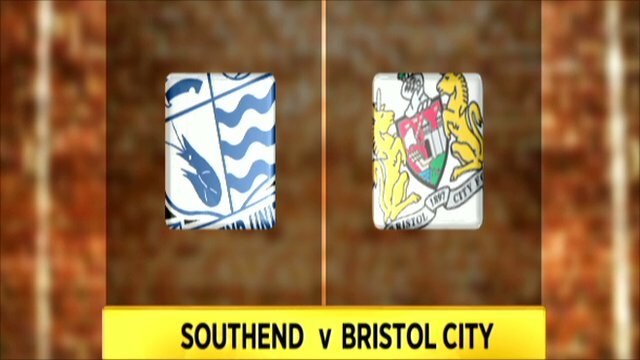 Free kick taken right-footed by Louie Soares (Southend) from left channel (25 yards), save (caught) by Dean Gerken (Bristol City). 82:41 Attacking throw-in by Ryan Hall (Southend). 81:58 Foul by Chris Barker (Southend) on John Akinde (Bristol City). Free kick crossed left-footed by Jamie McAllister (Bristol City) from right wing, clearance by Anthony Grant (Southend). 80:57 Assist (cross) by Albert Adomah (Bristol City) from left by-line. 80:57 GOAL - Ivan Sproule:Southend 1 - 2 Bristol City goal by Ivan Sproule (Bristol City) right-footed (bottom-right of goal) from right side of six-yard box (6 yards).Southend 1-2 Bristol City. 80:52 Goal kick taken long by Dean Gerken (Bristol City). 80:26 Shot by Anthony Grant (Southend) right-footed from right channel (30 yards), over the bar. 79:54 Foul by Marvin Elliott (Bristol City) on Barry Corr (Southend). Direct free kick taken right-footed by Louie Soares (Southend) from left channel, resulting in open play. 79:08 Foul by Ivan Sproule (Bristol City) on Anthony Grant (Southend). Direct free kick taken right-footed by Glenn Morris (Southend) from own half, resulting in open play. 78:56 Attacking throw-in by Jamie McAllister (Bristol City). 78:18 Defending throw-in by Jamie McAllister (Bristol City). 77:53 Goal kick taken long by Dean Gerken (Bristol City). 77:44 Shot by Anthony Grant (Southend) left-footed from left channel (20 yards), missed right. 77:16 Foul by John Akinde (Bristol City) on Anthony Grant (Southend). Direct free kick taken right-footed by Glenn Morris (Southend) from own half, resulting in open play. 77:08 Attacking throw-in by Nicky Hunt (Bristol City). 75:50 Foul by Barry Corr (Southend) on Marvin Elliott (Bristol City). Direct free kick taken right-footed by Dean Gerken (Bristol City) from own half, resulting in open play. 75:13 David Clarkson (Bristol City) caught offside. Indirect free kick taken right-footed by Glenn Morris (Southend) from own half, resulting in open play. 74:53 Goal kick taken long by Dean Gerken (Bristol City). 74:28 Outswinging corner from right by-line taken right-footed by Louie Soares (Southend) to near post, header by Matthew Paterson (Southend) from right side of penalty area (12 yards), over the bar. 74:20 Cross by Louie Soares (Southend), clearance by Liam Fontaine (Bristol City). 73:18 Direct free kick taken right-footed by Anthony Grant (Southend) from left channel, resulting in open play. 73:18 Booking Nicky Hunt (Bristol City) booked for unsporting behaviour. 73:18 Foul by Nicky Hunt (Bristol City) on Matthew Paterson (Southend). 72:38 Attacking throw-in by Chris Barker (Southend). 71:40 Direct free kick taken left-footed by Jamie McAllister (Bristol City) from right channel, header by John Akinde (Bristol City) from centre of penalty area (12 yards), save (caught) by Glenn Morris (Southend). 71:40 Booking Anthony Grant (Southend) booked for unsporting behaviour. 71:40 Foul by Anthony Grant (Southend) on David Clarkson (Bristol City). 71:23 Cross by Louie Soares (Southend), clearance by John Akinde (Bristol City). 70:54 Foul by Marvin Elliott (Bristol City) on Louie Soares (Southend). Direct free kick taken right-footed by Louie Soares (Southend) from right wing, resulting in open play. 70:27 Shot by Lee Johnson (Bristol City) drilled right-footed from right channel (25 yards), blocked by Graham Coughlan (Southend). 69:37 Foul by Ryan Hall (Southend) on Albert Adomah (Bristol City). Direct free kick taken right-footed by Gavin Williams (Bristol City) from left channel, passed. 69:02 Foul by Ryan Hall (Southend) on Gavin Williams (Bristol City). Direct free kick taken right-footed by Gavin Williams (Bristol City) from right channel, resulting in open play. 68:17 Goal kick taken long by Glenn Morris (Southend). 68:06 Defending throw-in by Jamie McAllister (Bristol City). 67:39 Goal kick taken long by Dean Gerken (Bristol City). 67:34 Cross by Louie Soares (Southend), resulting in ball out of play. 66:29 Direct free kick taken right-footed by Glenn Morris (Southend) from own half, resulting in open play. 66:29 Substitution Southend substitution: Blair Sturrock replaced by Ryan Hall (tactical). 66:29 Foul by David Clarkson (Bristol City) on Blair Sturrock (Southend). 66:11 Cross by David Clarkson (Bristol City), clearance by Luke Prosser (Southend). 65:24 Goal kick taken long by Glenn Morris (Southend). 64:05 Foul by Craig Easton (Southend) on Albert Adomah (Bristol City). Free kick taken left-footed by Jamie McAllister (Bristol City) from right channel (25 yards), missed right. 63:49 Corner from left by-line taken short right-footed by Louie Soares (Southend). 63:33 Shot by Anthony Grant (Southend) drilled right-footed from left channel (20 yards), save (parried) by Dean Gerken (Bristol City). 62:39 Defending throw-in by Josh Simpson (Southend). 62:01 Attacking throw-in by Josh Simpson (Southend). 61:38 Inswinging corner from left by-line taken right-footed by Louie Soares (Southend) to far post, save (caught) by Dean Gerken (Bristol City). 61:23 Shot by Anthony Grant (Southend) right-footed from right channel (25 yards), save (parried) by Dean Gerken (Bristol City). 61:04 Defending throw-in by Josh Simpson (Southend). 60:30 Goal kick taken long by Glenn Morris (Southend). 60:11 Substitution Southend substitution: Sofiene Zaaboub replaced by Barry Corr (tactical). 59:47 Cross by John Akinde (Bristol City), shot by Ivan Sproule (Bristol City) right-footed from centre of penalty area (18 yards), over the bar. 59:20 Defending throw-in by Nicky Hunt (Bristol City). 58:53 Defending throw-in by Josh Simpson (Southend). 58:35 Goal kick taken long by Dean Gerken (Bristol City). 58:04 Substitution Bristol City substitution: Jamal Campbell-Ryce replaced by John Akinde (tactical). 57:05 Foul by Jamal Campbell-Ryce (Bristol City) on Anthony Grant (Southend). Free kick taken right-footed by Matthew Paterson (Southend) from left channel (20 yards), over the bar. 56:53 Cross by Blair Sturrock (Southend), clearance by Jamie McAllister (Bristol City). 55:35 Defending throw-in by Chris Barker (Southend). 55:07 Attacking throw-in by Blair Sturrock (Southend). 54:36 Attacking throw-in by Chris Barker (Southend). 54:06 Goal kick taken long by Dean Gerken (Bristol City). 53:50 Header by Louie Soares (Southend) from centre of penalty area (12 yards), missed right. Correction - 53:13 Outswinging corner from left by-line taken left-footed by Sofiene Zaaboub (Southend) to near post, clearance by Albert Adomah (Bristol City). 53:13 Outswinging corner from left by-line taken left-footed by Sofiene Zaaboub (Southend) to near post, clearance by Marvin Elliott (Bristol City). 52:55 Shot by Louie Soares (Southend) drilled left-footed from right side of penalty area (12 yards), save (parried) by Dean Gerken (Bristol City). 52:38 Attacking throw-in by Chris Barker (Southend). 52:07 Foul by David Clarkson (Bristol City) on Graham Coughlan (Southend). Direct free kick taken right-footed by Anthony Grant (Southend) from own half, passed. 50:49 Foul by Gavin Williams (Bristol City) on Blair Sturrock (Southend). Free kick taken right-footed by Louie Soares (Southend) from left channel (30 yards), over the bar. 50:38 Defending throw-in by Chris Barker (Southend). 49:54 Defending throw-in by Chris Barker (Southend). 48:08 Defending throw-in by Jamie McAllister (Bristol City). 46:50 Attacking throw-in by Chris Barker (Southend). 46:13 Attacking throw-in by Josh Simpson (Southend). 45:42 Defending throw-in by Nicky Hunt (Bristol City). 45:31 Goal kick taken long by Glenn Morris (Southend). 45:01 Substitution Bristol City substitution: Cole Skuse replaced by Marvin Elliott (injury). 45:00+1:26 Defending throw-in by Jamie McAllister (Bristol City). 44:45 Defending throw-in by Nicky Hunt (Bristol City). 44:23 Defending throw-in by Jamie McAllister (Bristol City). 43:52 Defending throw-in by Josh Simpson (Southend). 43:26 Attacking throw-in by Jamie McAllister (Bristol City). 42:42 Goal kick taken long by Glenn Morris (Southend). 42:17 Shot by Ivan Sproule (Bristol City) drilled right-footed from centre of penalty area (18 yards), missed right. 41:36 Goal kick taken long by Dean Gerken (Bristol City). 41:03 Foul by Liam Fontaine (Bristol City) on Blair Sturrock (Southend). Direct free kick taken left-footed by Sofiene Zaaboub (Southend) from right channel, resulting in open play. 40:15 Foul by Graham Coughlan (Southend) on Lee Johnson (Bristol City). Direct free kick taken right-footed by Lee Johnson (Bristol City) from left wing, header by Albert Adomah (Bristol City) from centre of penalty area (12 yards), over the bar. 39:55 Attacking throw-in by Jamie McAllister (Bristol City). 39:40 Goal kick taken long by Dean Gerken (Bristol City). 39:21 Shot by Anthony Grant (Southend) right-footed from left channel (20 yards), missed left. 38:49 Inswinging corner from right by-line taken left-footed by Sofiene Zaaboub (Southend) to near post, clearance by Albert Adomah (Bristol City). 38:25 Foul by David Clarkson (Bristol City) on Graham Coughlan (Southend). Direct free kick taken right-footed by Glenn Morris (Southend) from own half, resulting in open play. 38:05 Defending throw-in by Jamie McAllister (Bristol City). 37:40 Goal kick taken long by Dean Gerken (Bristol City). 37:27 Cross by Josh Simpson (Southend), header by Anthony Grant (Southend) from centre of penalty area (18 yards), over the bar. 35:29 Attacking throw-in by Jamie McAllister (Bristol City). 35:03 Attacking throw-in by Jamie McAllister (Bristol City). 34:45 Goal kick taken long by Dean Gerken (Bristol City). 34:30 Shot by Sofiene Zaaboub (Southend) drilled left-footed from right channel (25 yards), missed left. 33:40 Outswinging corner from right by-line taken right-footed by Louie Soares (Southend) to near post, clearance by David Clarkson (Bristol City). 32:49 Shot by Lee Johnson (Bristol City) drilled left-footed from left channel (25 yards), save (caught) by Glenn Morris (Southend). 32:37 Attacking throw-in by David Clarkson (Bristol City). 31:47 Defending throw-in by Chris Barker (Southend). 29:15 GOAL - Matthew Paterson:Southend 1 - 1 Bristol City Placed penalty taken right-footed by Matthew Paterson (Southend) (top-left of goal), scored.Southend 1-1 Bristol City. 29:15 Foul by Jamal Campbell-Ryce (Bristol City) on Anthony Grant (Southend). 28:24 Inswinging corner from left by-line taken right-footed by Louie Soares (Southend) to near post, clearance by Gavin Williams (Bristol City). 27:33 Inswinging corner from left by-line taken right-footed by Louie Soares (Southend) to near post, clearance by Cole Skuse (Bristol City). 26:14 Foul by Lee Johnson (Bristol City) on Sofiene Zaaboub (Southend). Free kick taken left-footed by Sofiene Zaaboub (Southend) from right channel (30 yards), save (parried) by Dean Gerken (Bristol City). 25:49 Defending throw-in by Nicky Hunt (Bristol City). 25:06 Goal kick taken long by Dean Gerken (Bristol City). 24:56 Attacking throw-in by Sofiene Zaaboub (Southend). 24:23 Defending throw-in by Nicky Hunt (Bristol City). 24:18 Attacking throw-in by Chris Barker (Southend). 23:07 Albert Adomah (Bristol City) caught offside. Indirect free kick taken right-footed by Glenn Morris (Southend) from own half, resulting in open play. 22:35 Attacking throw-in by Lee Johnson (Bristol City). 21:07 Defending throw-in by Jamie McAllister (Bristol City). 20:35 Cross by Blair Sturrock (Southend), clearance by Liam Fontaine (Bristol City). 20:12 Defending throw-in by Josh Simpson (Southend). 19:28 Goal kick taken long by Glenn Morris (Southend). 19:19 Shot by David Clarkson (Bristol City) left-footed from centre of penalty area (18 yards), missed left. 17:54 Goal kick taken long by Dean Gerken (Bristol City). 17:04 Attacking throw-in by Josh Simpson (Southend). 16:51 Attacking throw-in by Josh Simpson (Southend). 16:36 Attacking throw-in by Josh Simpson (Southend). 16:14 Goal kick taken long by Dean Gerken (Bristol City). 15:13 Foul by Cole Skuse (Bristol City) on Blair Sturrock (Southend). Free kick taken right-footed by Louie Soares (Southend) from left channel (30 yards), over the bar. 14:52 Goal kick taken long by Glenn Morris (Southend). 14:30 Header by Liam Fontaine (Bristol City) from centre of penalty area (18 yards), missed right. 12:46 Foul by Sofiene Zaaboub (Southend) on Nicky Hunt (Bristol City). Direct free kick taken right-footed by Gavin Williams (Bristol City) from right wing, resulting in open play. 12:11 Shot by Matthew Paterson (Southend) right-footed from left channel (25 yards), save (caught) by Dean Gerken (Bristol City). 11:49 Cross by Nicky Hunt (Bristol City), save (caught) by Glenn Morris (Southend). 11:05 Attacking throw-in by Lee Johnson (Bristol City). 10:50 Defending throw-in by Jamie McAllister (Bristol City). 10:32 Defending throw-in by Jamie McAllister (Bristol City). 9:49 Foul by Blair Sturrock (Southend) on Liam Fontaine (Bristol City). Direct free kick taken right-footed by Dean Gerken (Bristol City) from own half, resulting in open play. 9:27 Shot by David Clarkson (Bristol City) right-footed from left channel (20 yards), save (caught) by Glenn Morris (Southend). 9:18 Attacking throw-in by Jamie McAllister (Bristol City). 8:29 Foul by Lee Johnson (Bristol City) on Anthony Grant (Southend). Direct free kick taken right-footed by Anthony Grant (Southend) from own half, passed. 8:05 Defending throw-in by Nicky Hunt (Bristol City). 6:54 Goal kick taken long by Glenn Morris (Southend). 6:44 Cross by Gavin Williams (Bristol City), resulting in open play. 6:20 Outswinging corner from right by-line taken right-footed by Gavin Williams (Bristol City) to near post, clearance by Sofiene Zaaboub (Southend). 6:09 Cross by Ivan Sproule (Bristol City), clearance by Luke Prosser (Southend). 5:28 Goal kick taken long by Dean Gerken (Bristol City). 3:57 Cross by Blair Sturrock (Southend), resulting in open play. 3:29 Attacking throw-in by Jamie McAllister (Bristol City). 3:00 Defending throw-in by Chris Barker (Southend). 2:23 Cross by Anthony Grant (Southend), clearance by Nicky Hunt (Bristol City). 0:28 GOAL - Jamie McAllister:Southend 0 - 1 Bristol City Free kick scored by Jamie McAllister (Bristol City) left-footed (top-left of goal) from right channel (30 yards).Southend 0-1 Bristol City. 0:28 Foul by Josh Simpson (Southend) on Albert Adomah (Bristol City).